For a writing project, I have been researching the area around Beaver Creek (remember where I got lost a few weeks ago?) outside of Seal Rock. It’s amazing how many narrow, winding dirt roads there are around here. You could get lost in the trees forever just a few miles from home. On my expedition up North Beaver Creek Road last week, I didn’t get lost, and I managed to navigate the muddy roads without falling off or running into anything. I turned around 7.3 miles in. It felt like the end of the civilized world and the road kept getting narrower and more slippery, but there’s a house out there. My car was covered with mud from tires to roof. I had to wash it when I got home, despite the cold, cloudy weather. Maybe someday I’ll find the courage to go all the way to the end of the road, but I probably shouldn’t do it alone. Back on the highway and a mile or two south, I treated myself to lunch at the Diner at Seal Rock. This used to be the Bears’ Cookie Den. The bears are gone, the cookies too, but it’s attractive and affordable, and the food is really good. Open from 8 to 3, it serves breakfast and lunch. On Thursday, the specials were a breakfast pizza and a southwestern hamburger. Last time I ate there, they had marionberry pancakes. I pigged out on a Reuben sandwich overflowing with meat and sauerkraut. This time, I went for the turkey sandwich with cole slaw. Delicious. The turkey sandwich is dressed with a blend of cranberry sauce and cream cheese. The diner, housed in a white building with blue trim that also houses a beauty salon and a real estate office, is full of light, with racks of newspapers, postcards and handknit scarves near the door, plus a case full of little pies. Country music plays in the background as the ladies who run the restaurant cook and serve the food. They take time to chat and make sure you have everything you need. After lunch, I decided to check out the Seal Rock store. Bad news. They’re closed. The Windemere real estate sign says “Quintessential Mom and Pop store. Mom and Pop want to retire. Equipment, appliances, fixtures. Two propane fireplaces.” You can buy it for $225,000. Dating back to 1923, the store still has most of the fixtures and merchandise inside. Wooden floors. Fishing gear, firewood, beer, milk, Coke, homemade tamales . . . It reminds me of where the Waltons shopped (remember Ike Godsey’s store?). I can just picture folks hanging out on the porch, making calls in the old-fashioned phone booth out front, or waiting for the bus. Of course there’s more to Seal Rock than a restaurant and a store. There’s the rock itself. More than one rock actually, visible at the state park on the west side of the highway. The rocks are huge, with waves crashing against them, seals lounging nearby, and tourists hunting at low tide for shells and agates. It’s a beautiful park with lots of parking and no admission charge. Once upon a time, when the only way to travel north or south from this area was by ferry boat, Seal Rock was a busy resort town. Visitors came from all over to relax by the beach and enjoy the ocean view. 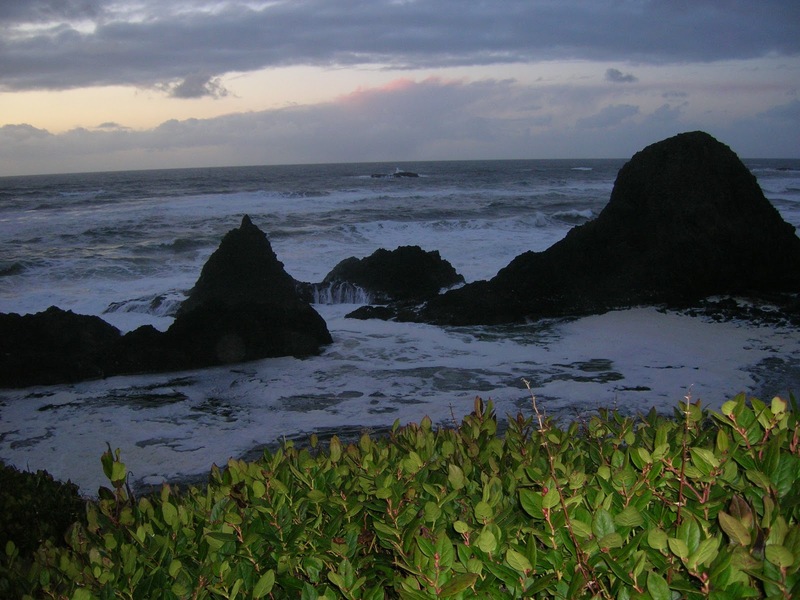 With the coming of the Yaquina and Alsea bridges in the 1930s, the towns to the north and south of Seal Rock grew, but Seal Rock remained a small community, not incorporated as a city, although it has its own zip code. Today it has a few bed and breakfast inns, the diner and a Japanese restaurant called Yuzen, a post office, laundromat, numerous antique shops and real estate offices, a glass-blowing shop, a fudge shop, several art galleries, including the marvelous McEneny woodcarving gallery, and a surprising number of wooden teddy bears. Once upon a time a chainsaw artist named Ray Kowalski carved life-sized human figures of all sorts and displayed them at a theme park called Sea Gulch. Ray and the park are gone now, but you can still see the remnants of the old saloon, and his descendants are still carving bears and other things to sell. For most of us, Seal Rock is just the place on the highway where we have to slow down to 40 mph, but it’s definitely worth a stop. And if you decide to explore up Beaver Creek, remember there are north and south Beaver Creek roads and they go to completely different places. If you opt to drive on past where the pavement ends, do it with caution, with a full tank of gas, and preferably not alone. Don’t go farther than you are comfortable. Don’t do it late in the day. Take your cell phone, flashlight, maps, snacks and water, blankets, dry shoes and socks, and a coat, just in case. See you in Seal Rock.